•	John Kington is congratulated for his 50 years’ service by his team-mates. 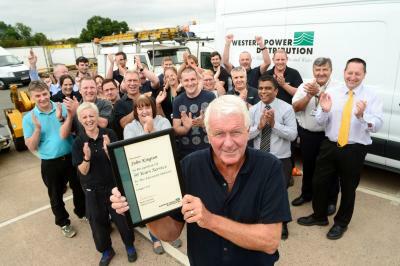 John Kington, a cable Jointer with Western Power Distribution (WPD) is celebrating an impressive 50 years of service in the industry. John, who lives in Bilton, Rugby, joined the company as a 15-year-old in 1966. He undertook a four year apprenticeship and has worked in the region ever since. Over the years, John also trained to work on overhead power lines, to fit meters and to carry out office duties and has also worked as a foreman. “When I started, the guys didn’t have their own company vehicles; an open-backed wagon would take everyone out to site and collect them at the end of the day. “As the junior member of the team it was my responsibility to make the tea, so I would often take my bike and cycle to site so that I could boil up the water and have the tea ready for when the gang arrived. “The job’s advanced a lot over the years and many aspects have become a lot easier and less physically demanding but the safety aspect still remains a priority,” said John. John and wife Mary have three children and four grandchildren, with two more due later this year. Having worked on the electricity network across much of Coventry and Warwickshire over the last five decades, John now plans to retire at the end of the month. “I’ve liked the job and always enjoyed working with a good gang of lads but it’s time to hang up my shovel now,” he said.